I don’t think very many people need reminding, but the farmers market is going strong down on Riverview Drive Saturdays and Wednesdays. Now the strawberries and snap peas are in — nature’s candy from the fruit and vegetable side of things. I think everyone I have met in Wausau was out at the market this morning, good to talk to all of you. Hope to see more of you next week. 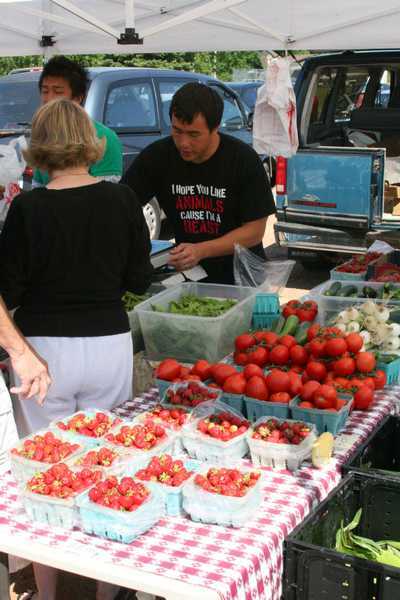 I will also remind folks of the Market Place Thursdays that place on the 400 block on, well, Thursdays. Wausau Area Events has upped the ante on the marketplace by adding entertainment, coming up next on July 12th will the Frisbee Dogs, you will want to come out and see that. 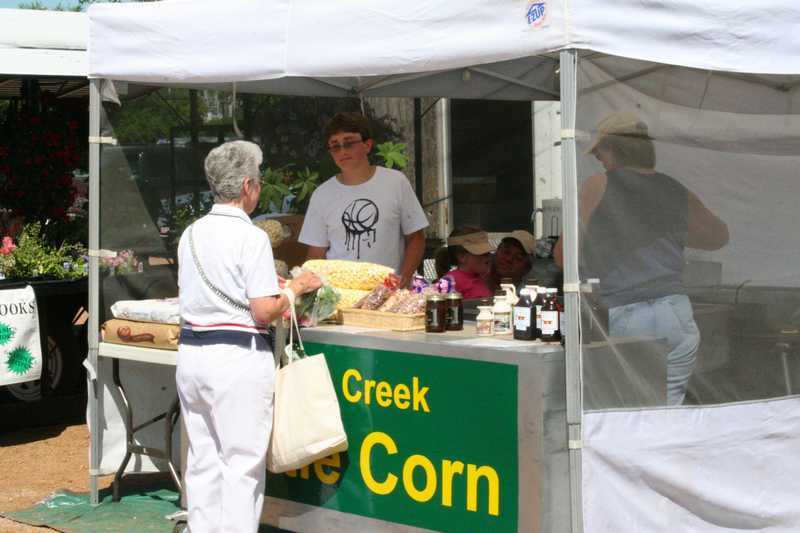 I noticed this popcorn stand at the farmers market this morning as being a new addition to the “family” ourt there. It is great that things continue to grow. I will say that I think there is more opportunity for folks who sell ready to eat food products at the Marketplace Thursdays. There are a number of folks on Saturday who sell baked goods and other yummies, but I don’t see them on Thursdays. There is a baker that is a regular on Thursday, and he seems to do booming business. I am sure that popcorn, sandwiches, drinks or whatever would also sell like gangbusters when the families and kids show up for the shows on Thursdays. Just something to think about. Well, it seems there is just one night left for music at the Scott Street Pub tonight. Last night was a hard rockin’g blues band with one of the best rhythm sections I have heard for a long time. They were certainly pumping out the beat. I am not a big fan of overly long guitar solos, but other folks seemed to be enjoying it. But the groove was good and people got up and danced, including the man of the hour. Tonight is the last night, and fittingly enough the Corpse Show Creeps will be closing the place. Nothing like going out with a psychobilly party. My understanding is that there will be some open mic time starting around 9 pm, hopefully with a few of the local folks who have played there getting one last chance to get some stage time at the Pub. Although as a physical venue the Pub is not perfect, it will surely be missed for the sheer volume and variety of live music that has been showcased there. The only place I can think of that is even close to that variety and volume is Clark Place down in Point. As Dino calculated in an earlier post, Tom Bergs and the Pub have poured probably at least a million bucks in to the pockets of musicians over the last 20 years. This represents a support of the arts that is almost at foundation levels. I am sure a place like the CVA would love to get a million dollar grant, even spread over 20 years. The Pub has been a tremendous resource, both to the city, but also to the musical community here. Hopefully, someone will step up and create a new venue for live music and get started on their million dollar grant. But in the mean time you can come out to the Pub tonight for one last chance to say “thanks” for the memories, and put a few last dollars into the live music jukebox that has been the Scott Street Pub. I didn’t really intend to talk about this so early, but since it has come out in the comments of another post, I feel I need to say something about the future of the Wausaublog. I have no idea what the future holds. I have been offered a position with the Wausau Buyers’ Guide as a writer/photographer/chief cook/bottlewasher. The paperwork is not all aligned yet for my hiring, but it looks as though I will be starting in the position soon. Basically one of the things they want me to do is write stories about the kinds of things I have been covering here on the blog for the past year or so. Which is good for me, I get a few dollars for what I have loved (and still love) to do. It might be bad for the blog though. 😦 I can’t afford to be scooping my own paper on a regular basis, and I am not sure how my new employer might feel about my writing about the same events from a more personal point of view in another “publication.” We shall see. My new boss is well aware of the Wausaublog, and didn’t say anything about not continuing it, but who knows if I will still have time for this kind of side project in the future. I have talked to my new boss about the benefits of daily content online to supplement the weekly and monthly nature of their print publications. So, I still may be making daily observations of our fair city, but in a different venue — time will tell. Either way, I will let you know whither thou goest with the Wausaublog, and will once again take this opportunity to thank everyone who has enriched this city with their contributions to the blog and to those who have enriched my life through your friendship, help and support. So it seems that two decades of musical heritage is now reduced to two nights and two nights only. Jim Carlson, his band and quite a few assorted friends, family and others took to the stage last night to begin the farewell to the Pub. For a place that has made its reputation with live music, this weekend’s musical windup is most appropriate. It may be true that the Pub has outlived its glory days by quite a bit. It is certainly showing its age and is no longer an ideal place for bigger shows. The stage is small, the room is acoustically awful and the lighting is marginal. But you cannot deny the atmosphere. You can almost feel the ghosts of all those who have come before. 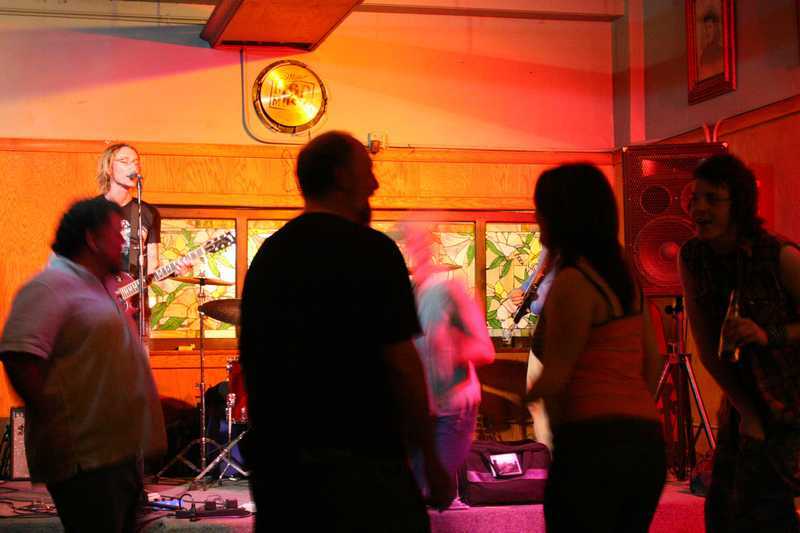 Even a venue as wonderful as Clark Place down in Stevens Point cannot match the pub for atmosphere, especially rock ‘n roll or blues atmosphere. The pub is drenched in that feeling. The last two acts scheduled for the Pub are perfect picks to match the atmosphere. Tonight, the blues take center stage as Adam Douglas and his band the Deacons take the stage. And for the grand finale, Corpse Show Creeps, a psychobilly band from Minneapolis provides the soundtrack. Over 50 years ago rock ‘n roll grew out of the intersection of the blues with rockabilly, if not actually in the Scott Street Pub, in places a lot like it. So you can relive history and at the same time see (and hear) the history book closing on an important era and irreplaceable music venue in our city. Hope to see you there. Tonight was the first Concert on the Square for this season, and it looked to me like it drew one of the biggest crowds. John Greiner and his Swingshift Band belted out big band classics from the World War II era, with probably the biggest band that will play on the square this summer. Lots of folks were up there playing. And lots more folks were out on the grass even listening. And a few folks even got up off their grass and danced a bit. A good time was had by all. If you would like to see and hear more of John and his big (really big!) band you can head out to the American Legion Hall (at 6th Street and Golf Club Road) the third Thursdays of the month for their open rehearsals, from 6 to 9 pm. The next (free!) open rehearsal is scheduled for July 19th. If you can’t wait that long for band music, you can check out the city band at Marathon Park tomorrow night, or come back to the square next Wednesday. The Marathon County Historical Museum’s new exhibits “A Time Of Change: Marathon County 1900 – 1910” and “Special Edition: 100 Years Of The Daily Herald” is opening June 30th with a big open house. Activities will feature live music, a drawing for 2 teddy bears (in celebration of the birth of Teddy Bears during Theodore Roosevelt’s presidency) and film clips showing the technology of the era. The exhibit curators, Linda Forbess and Kathy Jansen, will be there to answer questions about the exhibit. The early 1900’s was a dynamic period in Marathon County’s history. It was when the lumber industry was in obvious decline, giving way to the businesses of savvy entrepeneurs (including the Wausau Group). The history books, newspaper articles and even City Directories of the time show a wide array of businesses. The 1901 – 02 City Directory shows a bustling city with 10 cigar makers, 15 confectioners, 75 dressmakers, 30 general stores, 16 hotels, 13 lawyer firms and 9 meat markets. This is also the era of the introduction of new technology such as automobiles and planes. 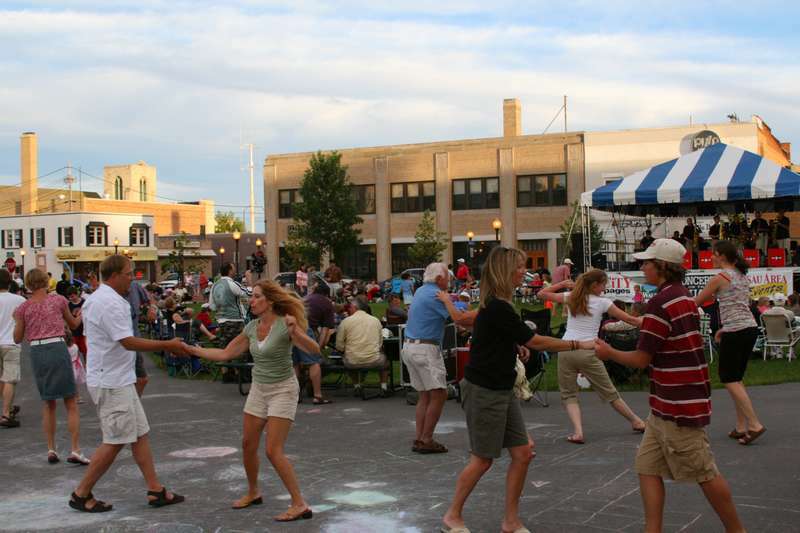 Residents could take the trolley from Wausau down to the Rothschild Pavilion for a day of fun. Electrical lighting and telephones were becoming more common. And don’t forget the Sear’s Catalog- the best friend of rural shoppers! Be sure to stop in Saturday, June 30th from 1:00 – 4:30 for the big opening. The exhibits will be on display from June 23, 2007 – May 2008. The museum is open Tuesday -Thursday 9:00 AM – 4:30 PM and Saturday -Sunday 1:00 – 4:30 PM. The exhibit is free and open to all. My apologies for not posting at my usual rate this week, I have been a bit preoccupied by a few matters. One of the biggest seems to have become the mural at the Scott Street Pub. As regular readers know, a few years ago an artist by the name of Marcus Nickel was hired by Tom Bergs to paint a mural on the wall of the second floor of the Scott Street Pub building. The upstairs room was to become another venue of the pub, either a dining room or second stage or whatever. For various reasons, the mural was completed, but the plans for the second story never came to fruition, and there the mural sat, mostly unseen, except by a few people who worked at the pub or knew someone who did. As the Pub teetered several times on being closed and the property bought by MCDEVCO, the development arm of the county, an underground campaign was launched to see if there was some way to save the mural from the wrecking ball that almost certainly hangs over that whole block. About 6 months ago I was told of the mural and given a chance to photograph it, and the photos are here on the Flickr site of the blog. But mostly we waited to see what fate would actually bring. But now fate has acted — along with MCDEVCO. As most of you know, MCDEVCO has in fact bought the property and the short term plan is to raze the buildings and put up a parking lot. Well, pave one anyway. It was last week that I got the email from Dino that simply said, “Anyone want to save a mural?” And it turns out a fair number of people do. I don’t want to start handing out public kudos yet, because the mural is not saved yet. I don’t want people to think that the people who are helping out did not do their jobs or something if the effort is ultimately unsuccessful. But I can say this. I put out calls and emails to people I have met through doing the Wausaublog and told them the situation, and pretty much to a person, they said, “What can I do?” Mostly I didn’t know at first, but ideas went around and suddenly things started to move a bit. People started looking for technical assistance from architects and historical preservation people. People who were involved with the original project have been found. Information has been exchanged, and plans are beginning to be formulated. We are a long way from having the mural “saved” but I think the people are in place to do so and more importantly, there is a general consensus that it should be saved. And I think that is a very good thing. It is a pretty happening city that saves a piece of its cultural heritage — and an awesomely cool city that saves that heritage even though it was the town’s best kept secret. If we can pull this off, Wausau will definitely be a cooler place. And just for the record, here is my personsal vision of what I hope can happen. I hope that we can physically remove the mural from the Pub building and eventually put it on public display somewhere. Many ideas have been suggested to me for that, like the Pavillion in Rothschild or somewhere on Artsblock. But what I personally hope for is that the mural will be included in the plans for whatever structure goes onto that block on Scott Street. I can foresee the mural wall surrounded by some plaques that tell of the musical history of the Pub and of Wausau. It would be a great way to recognize that musical heritage and provide a nice little tourist attraction to boot. As time goes on I am sure will be things we can all do to play our part in this. Right now I think the best thing we can do is talk up the idea so that the powers that be will see this as a worthwhile project. In the meantime, there is one more week to go at the Pub and a lineup of “last concerts” is in the works starting at 9:30 pm tonight. Even if you have not been there often, or even if it would be your first time, come on out and fill the place up one more time. It is never too late to say “thanks” to Tom Bergs and the Pub for filling our city with music and the energy that flows from that. The venue of the Pub will be sorely missed, so come out and make sure it has a fond farewell. See you there!